There are different types of paint sprayers out there, and it’s important to understand how each of them works to make the right decision. The most common type is the conventional high-pressure paint sprayer. Simple to use and fairly reliable, they can make a good all-around option, particularly if you don’t want to make a big investment. The problem with them is that they lack good paint control. This is where HVLP sprayers come into play. A High Volume Low Pressure (HVLP) paint sprayer allows for superior control because it’s designed to deliver a much narrower spray. Intricate work will benefit greatly from this kind of paint sprayer as it boosts the accuracy to the maximum. Another benefit is that they also cover the surface better. The last option to consider is an airless sprayer solution. This type makes use of the latest technology to allow you to paint without using air. It’s a solid paint sprayer to be used by a professional as it can offer many efficient features to make their job easier and less messy. To find out how powerful a particular paint sprayer is, you need to check certain indicators such as pressure or horsepower. With more paint out of the nozzle comes the benefit of greater coverage for the surface you’re working with. Those in a hurry should look for models with high pressure while others would prefer to work in a steadier manner with a more debilitated sprayer. Any paint sprayer out there is capable of taking paint from a container and sticking it to a surface. To figure out which one does a superior job in terms of surface coverage you should also check the volume measured in GPM besides the power specifications. To find the best bang for your buck in no time, this article could help you. It features a balanced selection of paint sprayers fitting for multiple budgets and more specific needs. The primary factor when creating this list was cost-effectiveness. If you’re looking to make a solid investment, check out these individual reviews to see which paint sprayer would be the best choice. You might also be interested in our articles about the best airbrush for cake decorating and the best pressure washers. The Wagner 0518080 is a capable HVLP paint sprayer that can make any painting job at home a breeze. It comes with many impressive features, but the most important ones are probably the variable air pressure control for enhanced accuracy and the two-stage turbine. Thanks to a Control Spray Max feature, this model allows you to deal with multiple types of paints, lacquers, and primers. The two-stage turbine is ideal for painting cabinets, decks, and various woodworking projects. It can handle thicker material and keeps over spraying of thin materials to a minimum with the help of variable air pressure control. When transitioning to a smaller project from a larger surface, you can rely on the variable flow control function to obtain the most satisfying results. The tool is lightweight without sacrificing the performance. Based on material viscosity there are many selectable spray patterns. Setting it up takes a little of your time. An included viscosity cup allows you to figure out the precise density of your material to make the right spray pattern adjustments. Depending on your specific application, you will have to turn the air cap for either horizontal/vertical patterns or for a round one. Dust can affect the final finish so that’s why the spray painter is equipped with two air filters to ensure the best final smoothness. Keeping the spray gun correctly position is also easier when you have a large 20-foot air hose at your disposal. Any homeowner or DIYer will appreciate the versatility and performance of the Wagner 0518080 HVLP Paint Sprayer. It’s a very practical unit to put to good use during various applications. Even if you’re not a painting professional you can still obtain superb finishes without overspray. Without a doubt, this one deserves the top spot on this list. For those with a lot of furniture to paint, the Fuji 2202 Semi-PRO 2 is a more professional unit to consider if you want a truly reliable HVLP paint sprayer. This is one of the strongest spray systems money can buy and it’s perfect for a weekend warrior and small shop alike. One key feature of this unit is the premium construction. It comes with a metal turbine case and a nozzle crafted using sturdy stainless steel. The needle tip has also received some durability treatments to ensure that wear will never pose a problem. The spray gun can be easily taken apart for maintenance. If you plan on integrating into your work materials with different viscosity types, this model feature various air cap sizes. It doesn’t really matter what you need to paint, this spray gun can deliver the right precision for the job. The Fan Pattern Control feature enables the user to reduce waste while working with the best precision possible. This fits nicely any vertical or horizontal applications. Tasks requiring a circular pattern can also benefit greatly considering the ability to make quick adjustments from circular to oval patterns. A very powerful motor has been installed to handle your painting jobs. The 2-stage bypass engine delivers 1400W of pure power which is quite surprising for an HVLP system. These models are usually underpowered as they focus too much on control, but this unit has no issues with obtaining even results with any coating type. After a bit of trial and error, anyone can become close to a master painter with the help of such a powerful HVLP machine like the Fuji 2202 Semi-PRO 2. It works great for furniture, but it doesn’t stop there. It has enough power to take care of some of the most demanding applications around. If you want to make a great investment, this paint sprayer is worth every cent. 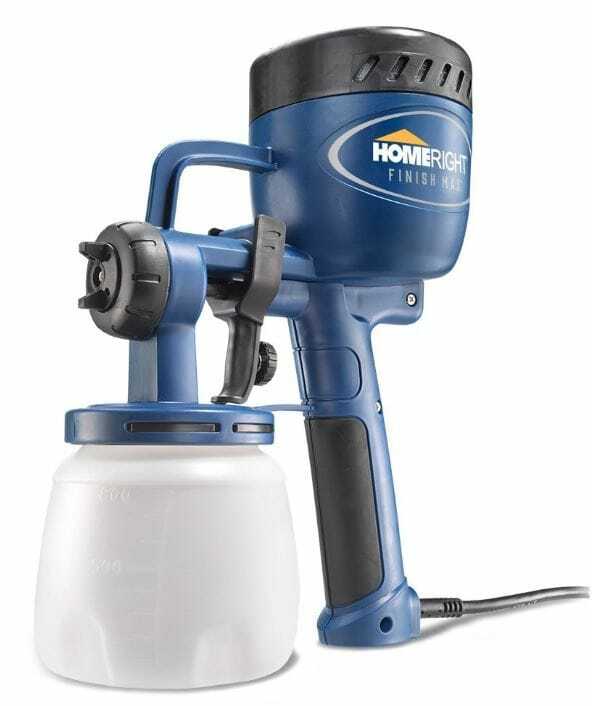 A more reasonably-priced HVLP paint sprayer is the HomeRight Finish Max C800766. Whether for walls, furniture, or other DIY projects at home, this device should fit the bill. Its most important feature is the impeccable user-friendliness enabling anyone to use it and maintain it without too much effort. As this is an HVLP spray system, it requires no compressor to work. The 400W motor of the unit is powered by electricity. A 27-ounce container offers a dedicated place to store the paint. Beginners will surely love this unit as it offers a simple setup compared to other hand-held models on the market. This paint sprayer comes with 3 spray patterns – the usual horizontal, vertical, and round. Some extra paint can be delivered to the surface thanks to a concentrated air flow. The device is also compact and lightweight allowing the user to keep working without feeling tired. The secret behind the workings of this paint sprayer lies in its Finish Max feature. This combines a brass tip and nozzle which together will deliver all the precise performance required to leave only a factory-like finish with tiny paint particles. Among the materials that can be used with this model, we can count various oil or water based ones. Some good examples are chalk, latex, and milk paints, as well as polyurethane, primers, and enamels. It will save you a great amount of time as opposed to using a classic roller. As a bonus, it will also provide cleaner finishes without marks left out through conventional methods. Overall, the HomeRight Finish Max C800766 is an incredible paint sprayer in all regards. It can’t be really compared to more professional units, but for this cost, this is definitely a bargain. It’s simple to use and has the potential to save you from the frustration of manual painting. If you’re into DIY remodeling, do yourself a favor and check out this paint sprayer. The airless technology for paint sprayers is all the rage nowadays. If you’re finally ready to take a step towards owning a capable unit of this type, perhaps you’d be interested in the Graco Magnum 262800 X5. 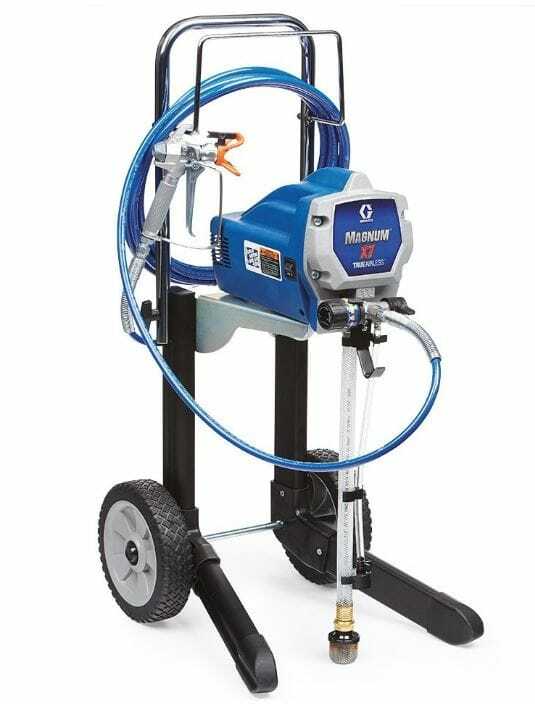 This is an airless paint sprayer that manages to strike a very good balance between features and cost. Successfully spraying paints that have not been thinned can be difficult if you don’t have enough power. This machine features a stainless steel piston pump which offers all the required pressure. There’s no need to bother with loading up paint into a special container. Just use the flexible suction tube and take the paint directly from the bucket. Clogs on the spray tip are often an issue on paint sprayers. To fix this problem, the manufacturer opted for an ingenious design called Reverse-A-Clean. This enables you to get back to the task at hand much faster as you quickly clean the tips. A similar feature is also available for the SG2 metal spray gun. At just 13.3 pounds, this is not a bulky paint sprayer, the compact size greatly facilitating moving around. Even if it’s lightweight, the frame has received some durability enhancements making you feel like you can count on your paint sprayer for lots of jobs over time. The high pressure offered by this unit is balanced by the fact that you can control it much better compared to other models. The paint flow can be adjusted according to the size of the project. Smaller ones will usually need better attention to details. When it’s time for cleaning, you can rely on the PowerFlush Adapter that can accommodate any regular garden hose. Considering the solid construction, performance, and all the convenient features of this unit, it’s safe to say that Graco Magnum’s 262800 X5 is a very cost-effective way to make the switch to an airless paint sprayer. Whether smaller or larger painting projects need to be finished, this model can handle everything with speed and finesse. Fuji Spray is a very appreciated brand in the industry and another of their models to consider is the Mini-Mite 4 PLATINUM. 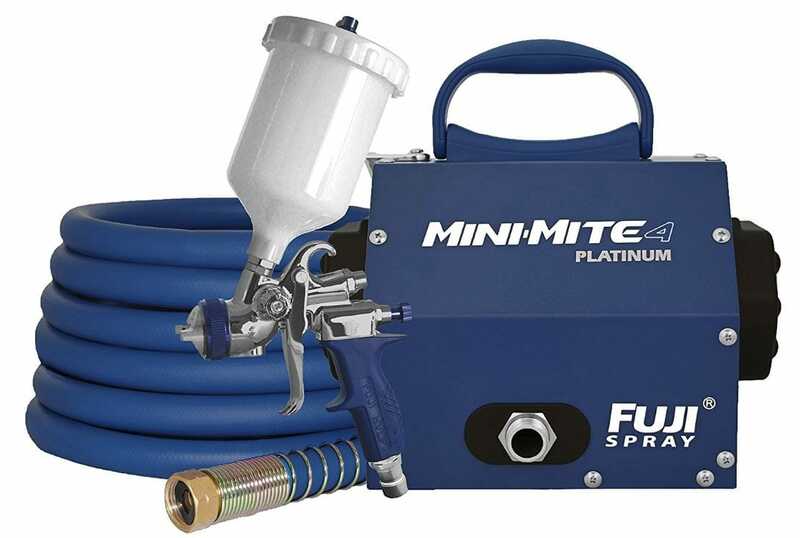 Anyone who’s into powerful HVLP spray systems shouldn’t miss out on this improved version of the Mini-Mite 3 PLATINUM which comes with more power to cover all your painting needs. The extra boost in performance comes from the outstanding 4-stage turbine which makes a huge difference over the competition. Thicker materials, in particular, can benefit from this superior level of power. There’s a durable metal casing in place to offer some protection. The casing is where you’ll usually discover the pattern control knob, but this unit is different. The knob is found directly on the spraying gun which means this paint sprayer scores high on convenience. No need to turn off the machine and change the pattern. You can now do that while working, an aspect which should increase your workflow. For a truly professional paint job you need to get a very smooth finish and one function that contributes to that is the non-bleed pistol function. The moment you take your hand off the trigger, the spray gun will instantaneously stop. The arc shape also remains consistent to deliver a constant paint flow where needed. The final feature worth discussing is the hose. The one on this unit is 25-foot long and was constructed with durability in mind. As proof of that, you can see that a plastic isolation has been integrated. This doesn’t affect its flexibility which is critical for a hose to be able to cut corners more easily. A very advanced HVLP system in all regards, the Fuji Mini-Mite 4 PLATINUM is easy to use and will exceed your expectations in terms of performance. Both the gun and the hose are carefully made with the best optimizations, and the whole unit seems to have been designed with uncompromised quality. If you can afford it, this is definitely the ultimate paint sprayer to buy. If most paint sprayers on this list are too expensive for you, a very budget-friendly choice comes from Critter Spray Products. Their 22032 118SG model is a fairly basic spray gun kit which needs an air compressor to function. If you already have one which can deliver 3 CFM at 90 PSI, then you might be better off by going with this option. 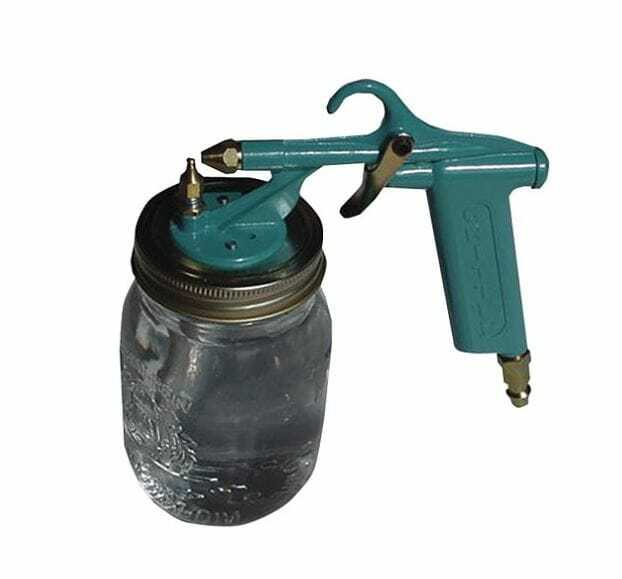 A standard mason jar has been included with this paint sprayer for storing your material. It’s designed to be airtight to save some time when preparing for the next painting job. If you need a larger container, the sprayer can adapt to other without too much effort. At 30 pounds PSI the little device can spray various latex paints, stains, and lacquers. It works well for gluing projects too or many laminating jobs. If you plan on using multiple colors, one practical solution to try is to keep multiple jars with different products in them. This way you can change the color pretty fast whenever it’s needed. To use the unit all that’s required to do is to set the right pressure at your air compressor and make sure the nozzle is correctly adjusted. You won’t need extra nozzles for most materials. There’s not very fine material control possible with this paint sprayer but you can still move the nozzle up or down resulting in a circular pattern. When the job’s done there’s not much cleaning left to do. Only the nozzle and liquid tube will require it because through the gun there’s only air that’s passing. Simple, but effective – that seems to be the best way to sum up this little paint sprayer from Critter Spray Products. While many people will probably not go in with too many high expectations, the 22032 118SG model will make it easy to achieve a decent finish. All in all, this is a solid tool which can make any DIY painter fully satisfied. 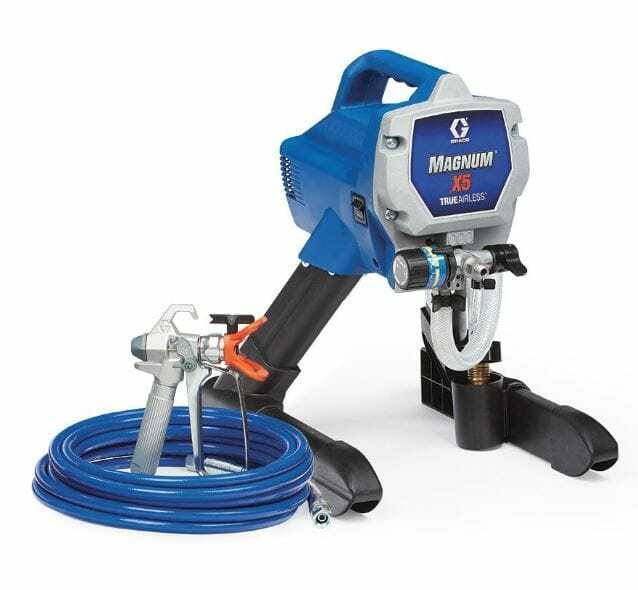 Graco Magnum has many powerful paint sprayers in their catalog. A solid airless electric model to consider is the Project Painter Plus (257025). There are many reasons for that, but perhaps the most critical one is because you’ll be able to obtain the ultimate level of control for the flow of the paint. The main feature of this unit is probably the adjustable pressure. Take control of the painting process using the knob that ensures you always get the same high-quality finish even if you’re working on different projects. The settings come with intuitive symbols to select between multiple pressure styles. Included in this package is an SG2 spray gun which seems to have been built to be as durable as possible. Its metal design contains a filter created specially to prevent clogging issues that can happen with the tip. The Reverse-A-Clean tip is reversed with a simple move to remove any blockage that appears. The sprayer weighs only 10 pounds which means you can quickly move around to work and you’ll also have no issues when it comes to storage as it’s nice and compact. Another solid feature that’s usually found on more expensive units is the piston pump manufactured out of stainless steel. Not only this helps with durability concerns, but it will also make your work with unthinned paints a breeze. 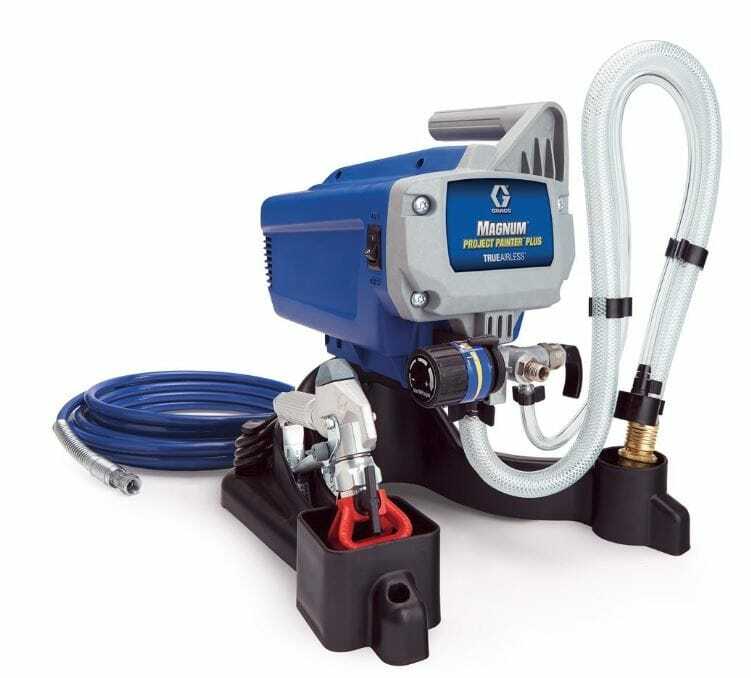 Other relevant features of this paint sprayer are the flexible intake hose and PowerFlush adapter. The first can take material directly from containers with capacities of 1 or 5 gallons. With the help of the garden hose adapter you can speed up the cleaning process as removing residue can be done much more efficiently with water. To get smooth painting results in record time you should definitely consider the Graco Magnum 257025. Everything has been designed with convenience and efficiency in mind so the whole spray system makes almost anyone a skillful painter. There are less expensive models out there, but this unit is also capable of reducing overspray so it offers solid coverage while being economical as well. 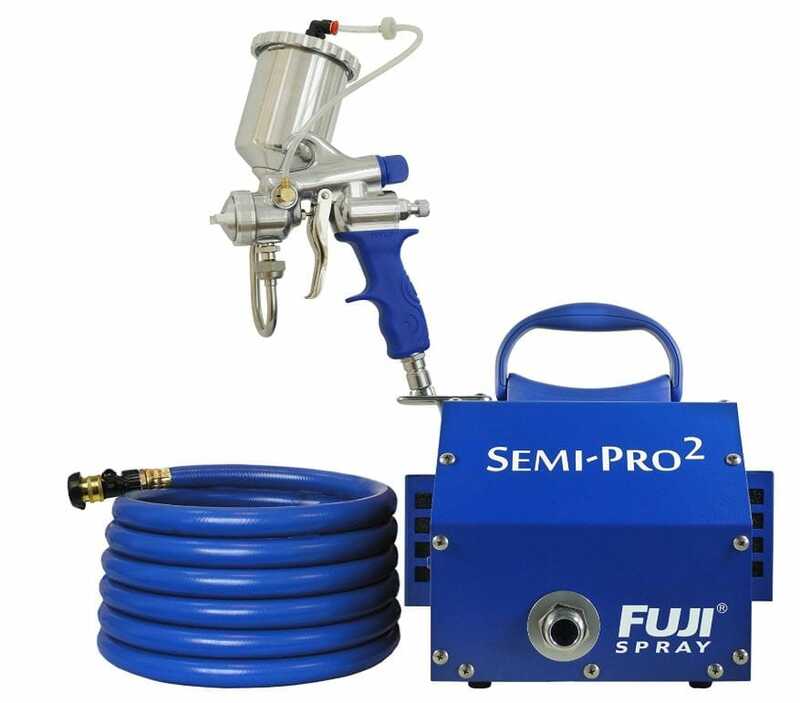 Both workshop or residential users might benefit a lot from getting a capable HVLP paint sprayer like the Fuji 2203G Semi-PRO 2. This unit comes with a professional spray gun which enables you to make the correct adjustments for the best painting results possible. There are many more interesting abilities which we’ll cover in the following paragraphs. Beginners and experts alike will be pleased by the two-stage motor which boasts a 1400-watt rating. It’s suitable to work with virtually any kind of coating for any type of painting project whether we’re talking about smaller or larger ones. A metal case offers decent protection. A 25-foot hose can be very handy during the operation. It comes with an air control valve installed which should tackle the overspray issue. The factor that helps the most with achieving a professional finish is the non-bleed function. The paint sprayer is designed to create an even coverage with minimal effort. Adjusting to the right pattern can be done with a simple control knob which offers increment adjustment. Getting the right look for your particular task is easier when you can go from limited circular patterns to wider ones. Your work productivity can take a hit if you don’t have enough capacity. This is why the spray system offers a 1-quart bottom feed cup created for high volume delivery. One essential element of this paint sprayer is the 400cc Gravity Cup to guarantee a more convenient spraying action. Wear on the needle tip is kept to a minimum thanks to the reinforced stainless steel used on the liquid passages. For this reason, the unit is definitely recommended for waterborne and coatings based on solvents. 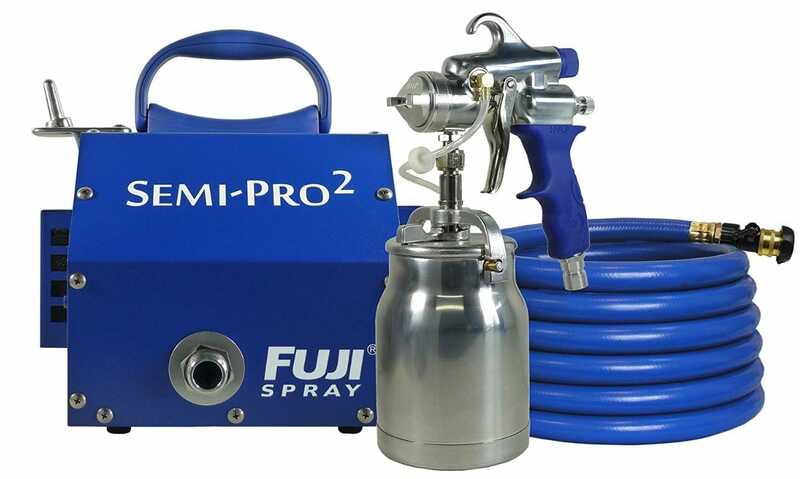 Taking into account everything, the Fuji 2203G Semi-PRO 2 can be a very reliable solution if you’re seeking a more professional HVLP paint sprayer. Despite being labeled ‘Semi-PRO’, this unit could be easily considered fully ‘Pro’. It goes through every painting task like a breeze. In case your budget allows it and you’re willing to go the extra mile to work on bigger projects, there’s no better option than the Graco Magnum X7. This is an airless paint sprayer that offers a great performance rating of .31 gal/min, easily adjustable pressure, and a simple way to move a large paint container thanks to its wheeled design. 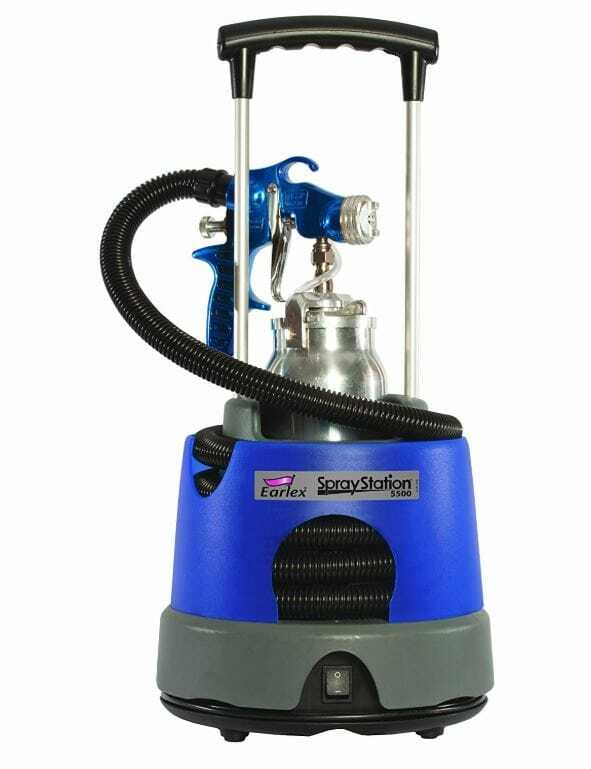 Like other airless paint sprayers in this lineup, this unit comes with the reliable SG2 metal spray gun. It’s packed with a dependable filter for making tip blockages a thing of the past. The RAC IV SwitchTip is also quite advanced as it implements in its construction a reverse function for removing clogged up debris. There are lots of features that help with the productivity. One, in particular, is the suction tube which has been designed to be very flexible. Get the machine to start spraying by placing the tube directly in a paint bucket. This is a model that’s been obviously designed for very large jobs. It can handle 100 feet of paint hose so you can deal with a comprehensive spraying of big homes. It’s recommended for this paint sprayer to use a maximum of 125 gallons in a year. The performance of the spray system is clearly a standout feature, but the control is even better. The material flow can be adjusted easily for that extra precision which is often required for certain tasks. The stainless steel piston pump doesn’t have particular considerations regarding the thickness of the paint. Even unthinned types can be easily handled at high pressure to enjoy superb final results in record time. In conclusion, the X7 airless paint sprayer proves once again that Graco Magnum’s reputation in the industry is not just for show. From handymen to DIY homeowners, anyone can take advantage of the superior performance of this unit which is ideal for simplifying your work and ensuring maximum satisfaction. 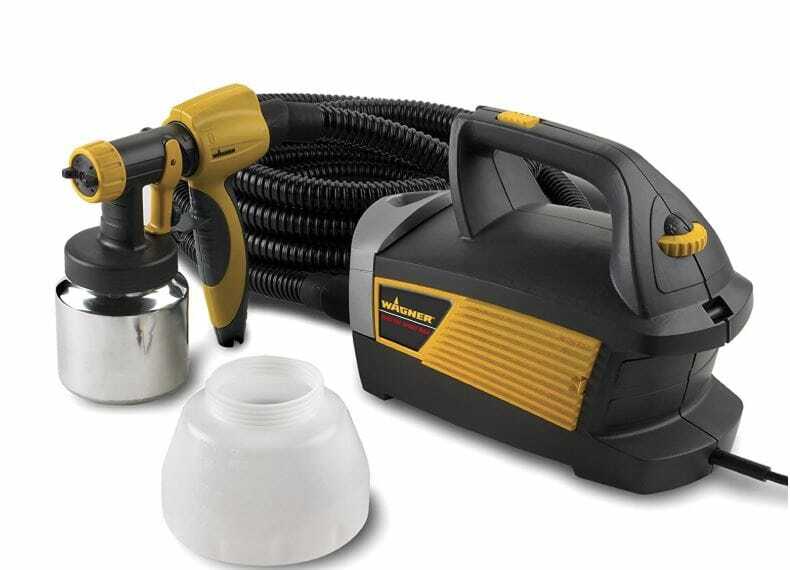 A very underrated paint sprayer to consider is the Earlex HV5500. This HVLP spray station is constructed specifically to cover the needs of semi-pro users. That’s why truly serious DIYers and those taking on light contractor jobs will really get the most benefits out of this one. A strong 650W turbine delivers the required performance to obtain an excellent finish for your painting jobs. This combined with the cutting edge design of the tip which offers superior atomization, ensures a more comfortable spraying experience without worrying about excessive overspray. On the spray gun, there’s a convenient system for switching to a different spray pattern. There are various fan widths ranging from 1- to 12-inch. With a simple ‘push and click’ you can go from a vertical to a horizontal pattern or to a round one. Many projects demand a good level of mobility. There’s a practical integrated handle found on this spray station making this ideal to carry to different places. In fact, you can use this paint sprayer both indoors or outdoors and there’s a considerably vast range of supported materials. Just to name a few we can mention thinned latex, varnishes, oils, shellacs, and acrylics. Simple loading and cleaning can be achieved by using a special container that comes coated in Teflon with a 1-quart capacity. An extra space onboard is dedicated for storing the spray pistol, power cord, and air hose – which features a 13 feet length. While not as easy to use compared to other paint sprayers on this list, the Earlex HV5500 is worth a shot if you have the patience to master its abilities. It’s capable of delivering an almost authentic factory finish quality to your paint jobs. To get the most out of it, it’s almost mandatory to get extra needle sizes separately because otherwise, your accuracy can suffer when it comes to certain detail-oriented projects.